The Anchorage Economic Development Corporation’s annual forecast for the local economy is usually pretty sunny, but the steep drop in oil prices last year means Anchorage and Alaska are in the midst of the first economic downturn in nearly three decades. 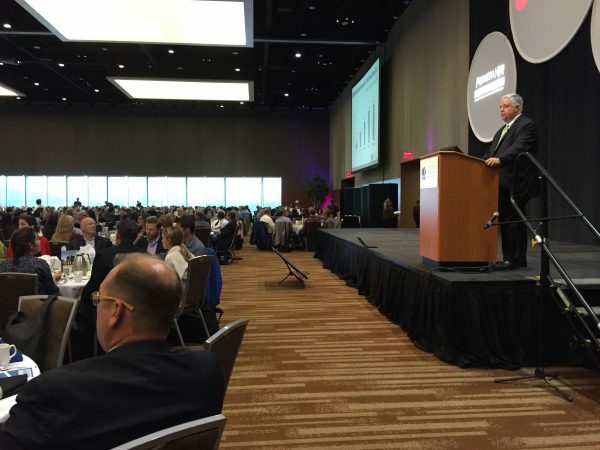 Still, the overall message at the AEDC’s annual economic forecast luncheon at the Denai’na Center in downtown Anchorage Wednesday wasn’t all doom and gloom. AEDC CEO Bill Popp said if you want to sum up the forecast for the pain that those plunging oil prices are going to deliver to the city and the state, you should think pinch, not punch. “Our view is that it’s going to be a sharp pinch, and it’s definitely going to leave a mark on the economy, but it’s not going to be a knockout blow to the economy,” he said. Here’s the outlook as Popp explained it before the 1,500 attendees settled down to lunch and a string of speakers. Anchorage is going to shed about 1,600 jobs in 2016, and nearly as many next year. That’s about a 1 percent loss annually. The biggest job losses will be in oil and gas and professional and business services. Plus, the state’s capital budget dropping to just about nil means construction is also taking a big hit, and that has a ripple effect on retail and service employment. But Popp said some of those jobs could come back in 2019 if oil rebounds and starts pulling the economy back up. He said a lot of industry watchers are expecting per-barrel prices to return to the high $50 range within a few years—but they’re not going to bounce back to where they were pre-2015. “We’re actually sailing through this with pain, but not devastating pain,” he said. He said there is something everybody should be worried about, and that’s how you’re feeling right now. The AEDC tracks something called the Anchorage Consumer Optimism Index, and in 2016, it hit an all-time low. He said a big part of the problem is that the state government still hasn’t come up with a long-term fiscal plan. If there’s one urgent takeaway from the economic report, he says, it’s this: Put pressure on the state to come up with a budget people can be confident in.